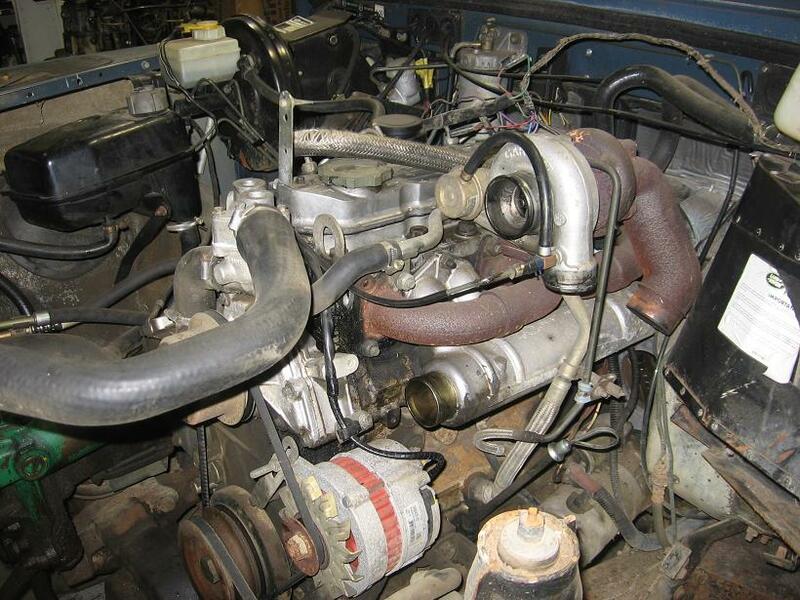 On pre-1990 Defenders the weakest point was always the engine. The choice was four cylinder petrol (thirsty, not that quick), non turbo diesel (desperately slow and not as economical as you'd expect), 2.5 turbodiesel (still not that quick, chocolate pistons) or V8 (mpg in single figures if driven hard). So when early Discoveries turned out to have the fastest-rusting bodywork since the Lancia Beta, people started looking at dropping the strong, reliable, powerful 200TDi engines into older Defenders. There must be thousands of these conversions out there and they are still as popular as ever. Some people will tell you that the Disco 200TDi motor 'just bolts straight in'. It isn't as simple as that. Although the Disco engine shares the same basic block dimensions with the older four-cylinder engines, it was designed to fit in a very differently shaped engine bay (the Disco was basically a reskinned Range Rover, with an engine bay intended to take a V8) and there are a lot of fiddly problems to solve if you want your conversion to look tidy, run well and be reliable. So I have put together this guide. It is not intended to be a bolt-by-bolt instruction manual. I am assuming that if you are contemplating an engine swap you already have reasonable mechanical skills and know that you have to take the old engine out before you try to fit the new one. The idea is to cover the main problem areas and give you some idea whether it is a job you can tackle yourself, or whether you are better off leaving it to someone who has done the job before (i.e. me). Why convert to 200TDi power? More power - 111bhp or thereabouts, against 85 for a factory-fresh 2.5TD, 67 for a 2.5 NA. Most TDs are putting out a lot less. The TDi does not seem to suffer from bore and piston wear like the older engines, so the power output does not drop off as badly with age. Better economy - direct fuel injection gives 30mpg or better. More reliability - easy cold starting, and the whole engine is far more durable than any Land Rover engine before it. There are plenty of 200TDis out there still running perfectly with more than 250,000 miles on them. If you live in London, or plan to drive there, you need to be aware of the new Low Emission Zone rules due to come into force at the start of 2012. There has been a lot of discussion about this on various Land Rover forums, and there is still the possibility that the rules will be changed again. But as things stand, once the new rules come in, any TDi (or pre-TDi) diesel Land Rover registered after 1 Jan 1973, apart from factory-built Station Wagons (which are considered as cars and therefore outside the scope of the LEZ), will be charged £100 PER DAY to drive anywhere inside the M25. This throws up a huge number of anomalies: some owners of genuine Station Wagons are finding that their vehicles are shown on the database, because they were registered with DVLA as commercial vehicles rather than cars when they were new. Some people have managed to get Nineties reclassified as Station Wagons by DVLA (after fitting rear seats and side windows), others have tried exactly the same request and been turned down. It is an absolute nightmare and we can only hope that Transport for London will decide that it isn't worth the hassle and exempt Land Rovers from the LEZ. But I'm not holding my breath. Apart from that, I can't think of any downsides at all to TDi converting your old Defender. It really is the best value for money of any modification you can make to it. MIG welder. It is possible to do the conversion without one but you will have to buy rather than fabricate some bits. Crank locking tool and breaker bar with 30mm socket - if you are planning to change the timing belt (which I strongly advise). Click here for more information on timing belt changes. M10 counterbore - for modifying the flywheel housing (see 'Engine preparation' below). M6 (turbo housing) and M10 (flywheel housing) thread taps. 200TDi engines come in three flavours, identified by the engine number which starts 11L, 12L or 13L. 11L - this is the version used in Defenders from 1990. High-mounted turbo, low-mounted injection pump. If you are offered one of these at a sensible price, complete with all ancillaries, snap it up. The conversion becomes a straight bolt-in swap that you can probably do in a day. Be aware however that the manifolds are no longer available new and almost impossible to find second-hand. To be worth having a Defender 200TDi has to have the manifolds, power steering bracket and pump, radiator/intercooler assembly and pipework, air cleaner with bracket and hoses, oil cooler pipes and fuel filter housing. Some of these parts are still available new but not all, and they will be very hard to find second-hand. Defender 200TDi '11L' engine - note high-mounted turbo. Do not confuse this with the old '19J' turbodiesel which also has a high-mounted turbo. TDi has a nearly flat, ribbed rocker cover, 19J is rounded and smooth. I know someone who paid a lot of money for what he was assured was a Defender TDi engine. What turned up on a pallet was a knackered 19J. He was not happy and I don't think he managed to get his money back. 12L - Discovery with manual gearbox. This is the most common variant and the one with which these notes are mainly concerned. Only one significant design change around the end of 1992 where the design of the unions on the oil cooler pipes was altered. (See 'Oil cooler pipes' later in the article). 13L - Discovery with automatic gearbox. This is the same as the 12L except for the backplate and flywheel. If you are replacing a very late 2.5NA or 2.5TD you can use the flywheel housing and flywheel from your old engine, otherwise you will have to try and track down a dead 12L to provide the parts. In 1993 Land Rover replaced the 200TDi with the 300TDi in both Defender and Discovery. This is a different engine in many respects and not what you want (I will publish a guide on installing the 300TDi when I get round to it). Main identifiers are the engine number (300TDi start 16L, 21L or 23L) and the belts at the front. 200 has two Vee belts, 300 has a single flat ribbed belt and spring loaded tensioner. On a 300 the air intake on the turbo faces towards the rear of the engine, on the 200 it faces to the front. That should be enough to stop you buying the wrong engine by mistake. The best way to acquire a 200TDi is to buy an MOT-failed Discovery. That way you can hear the engine running and be sure that it comes with all the ancillaries you will need (see below for list). Once you have taken the engine out you can send the vehicle for scrap and get some of your money back. The riskiest approach is to buy an engine which is already out and on the floor. You can't hear it running and you only have the seller's word that it is any good. It might even be stolen - avoid engines where the number has been ground off. An engine from a dealer or breaker may have a warranty, but if it turns out to be duff you still have to take it out and return it to get your money back. You won't be able to learn much from looking at the engine. Almost all old 200TDis are filthy, oily and look horrible and neglected. Check it actually turns over, look inside the oil filler cap for black sludge or white 'mayonnaise', look for major oil leaks from odd places and look for evidence that the engine has been left sitting outside uncovered (bright orange rust on the flywheel and front pulleys is a dead giveaway). What parts do you need? At the very least your engine needs to come with the following: Injection pump, power steering pump, turbo and manifolds, flywheel and housing, radiator/intercooler assembly, intercooler top and bottom hoses, air filter assembly and pipework. Ideally you want the fuel filter housing (essential if converting from petrol). Petrol conversions will also need the glow plug relay and wiring harness, and possibly the battery positive lead. You don't need the engine mounts or cooling fan. You can use the alternator from your old engine with the front plate rotated through 120 degrees (although the Disco alternator is more powerful than the standard Defender one), and if the starter is missing, the 2.5NA or TD starter will be a straight swap. The starter from the 2.5 petrol will not fit. If your donor vehicle has air conditioning, grab the twin 11 inch fans from the front. If you have a vehicle without power steering and are planning to convert it, salvage the old power steering box from the Disco along with the fluid reservoir. Even if the box is shot you will need it as an exchange unit. How much to pay? As the supply of dead Discos starts to dry up, prices are on the increase. I have paid as little as £130 for a complete engine in unknown condition (which turned out to be very good). Expect to pay around £450 for an engine 'on the floor', maybe a bit more if you get to hear it running before it is removed, £650 or so for a complete Disco (you can sometimes find them for much less), and around £1100 for a Defender engine complete with all the bits. From your old engine you will need the mounting brackets, oil cooler pipes (if fitted) and wiring harness. The rest you can sell for whatever you can get for it. Don't expect too much unless it is in really good shape, and try to find a buyer before you take it out - so they can hear it running and pay you more for it.